The Kommuninvest Cooperative Society is the parent society of the Kommuninvest Group. The Society is owned by a large number of Swedish municipalities and county councils with the purpose of enhanc- ing the efficiency of their financial opera- tions. Together with Kommuninvest i Sverige AB and Kommuninvest Fastighets AB, the Society forms a financial group of companies. Good governance and control are crucial to the Kommuninvest Group, since it is publicly owned and has a role of considerable responsibility. The Corporate Governance Report for Kommuninvest i Sverige AB is included in that company’s Annual Report. 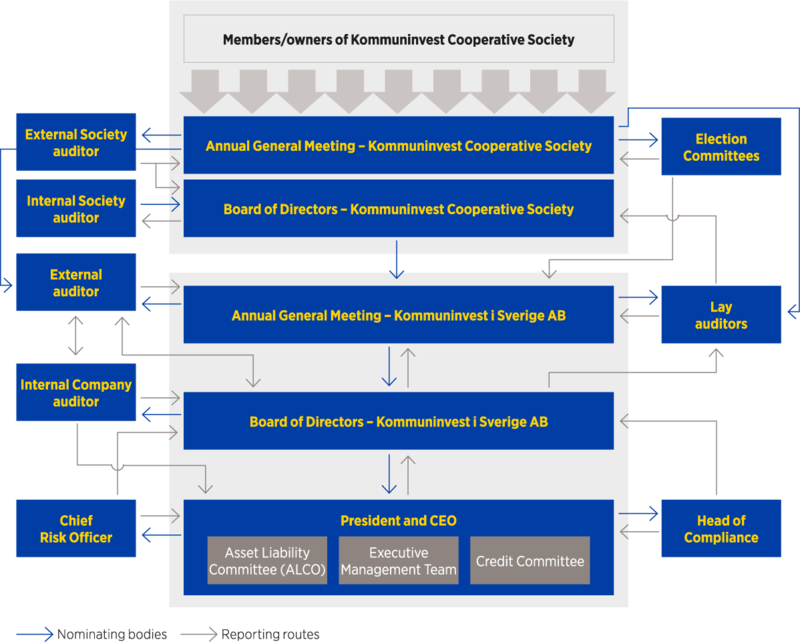 The Kommuninvest Cooperative Society (“the Society”, corp. ID no. 716453-2074) owns 100 percent of the shares in Kommuninvest i Sverige AB (“the Company”, corp. ID no. 556281-4409). The Company owns 100 percent of the shares in Kommuninvest Fastighets AB (corp. ID no. 556464-5629) and 50 percent of the shares in Administrative Solutions NLGFA AB (corp. ID no. 556581-0669). the Society based on number of residents. At 31 December 2014, the Society had 280 (278) members. The Group is owned by Swedish municipalities and county councils. The Society is a cooperative venture with the principal purpose of providing members and their majority-owned companies access to cost-efficient and stable loan financing. All business operations are conducted within the Company, while the Society deals with matters concerning membership and ownership. Presented below are some of the principles that affect internal corporate governance. Beyond these, the Board of Directors of the company has established principles, stances, limits and target figures in a number of steering documents and instructions. To stimulate owner influence and dialogue, annual member consultations are conducted at which representatives of the Board of the Society discuss current issues with representatives of the membership in a smaller-scale forum. Member consultations represent important forums for the preparation of matters for resolution by the Annual General Meeting. Ahead of the 2014 Annual General Meeting, member consultations were held in 18 (19) locations around Sweden, with some 391 (330) participating politicians and officials. The Board of Directors of the Society develops directives for the Company and these are set annually at the Annual General Meeting. The owner directives set out the framework of the operations assigned to the Company by the Society. The owner directives primarily include guidelines regarding risk levels, remuneration principles, principles for business travel and representation, financial knowledge, development of products and services, and for any special assignments set for the Company by the Society. The owner directives are set annually by the Annual General Meeting of the Company. The Kommuninvest Group’s overarching objective is to generate the greatest possible benefit for the members of the Society. Among other measures, this shall be ach-ieved by maintaining a high proportion of satisfied customers, by accounting for a large proportion of members’ loan financing, by maintaining a high level of cost efficiency and having the financial strength to support the long-term focus of the operations. Follow-up on the targets is presented on page 5. The Board of Directors of the Company sets the remuneration principles applicable within the Group, in accordance with the ownership directives. The Society has no salaried employees. Remunerations shall engender conditions to attract, retain and motivate employees so that operations can be conducted in an optimal manner. The basic principle is that remunerations and other terms of employment should be in-line with the market and should consist solely of fixed wages. No variable remunerations are paid. Wages are set taking into consideration the tasks involved and their degree of difficulty, responsibilities, educational requirements and how the employee fulfils the demands imposed and contributes to improvements in operations. The Annual General Meeting of the Society is the Group’s highest decision-making body. The Annual General Meeting of the Company is held in direct connection with the Annual General Meeting of the Society. • The first of two resolutions regarding amendments to the Articles of Association for the Society and its companies. • Annual contribution commitments for 2014. • Adoption of owner directives for Kommun- invest i Sverige AB, including guidelines for remuneration to the President and CEO, the Deputy CEO and other members of the Executive Management Team of Kommuninvest i Sverige AB. • Rules of procedure for the work of the Election Committees. • Rules of procedure for the work of the lay auditors. There are two Election Committees within the Group; the Election Committee of the Society and the Election Committee of the Society’s companies. The Election Committees bear the ultimate responsibility for the preparation of appointment decisions through a structured and transparent process allowing the members to give their views on proposals and to submit their own proposals regarding appointments and associated issues, thereby establishing favourable conditions for well-founded decisions. The Election Committee of the Society is elected by the Annual General Meeting based on a proposal submitted by the Board of Directors of the Society. The Election Committee of the companies owned by the Society shall represent the Board of Directors of the Society and consists of members elected by the Board from its own membership. The Board of Directors of the Society has resolved that its working committee shall act as the Election Committee. Board work is conducted in part by the Board of Directors of the Society, and, in part by the Board of Directors of the Company. The main principle is that the Board of Directors of the Society deals with membership and ownership issues, while the Board of Directors of the Company deals with issues involving business operations. This means that issues concerning new members, withdrawal of members, possible exclusion from membership, guarantee issues, etc. are dealt with by the Board of Directors of the Society. The Board of Directors of the Company deals with financing issues, credit issues (such as limits and analyses), as well as other operational issues. However, the connection between the two boards is strong, since certain issues concern both the Board of Directors of the Society as well as that of the Company. However, the Board of Directors of the Society, which represents the owners, has no direct right of determination over the Board of Directors of the Company. The Society’s control of the Board of Directors of the Company takes place only by means of resolutions by the Annual General Meeting or by owner directives adopted by the Annual General Meeting. From among the members of the Board of Directors of the Society, a working Committee is appointed each year, including the Chairman of the Board, the Vice Chairman of the Board and at least one other Board Member. On assignment from the Board of Directors, the Working Committee is responsible for matters including the preparation of the work of the Board of Directors and for annually assessing the work of the President. The Working Committee also acts as the Election Committee of the Society’s companies in accordance with rules of procedure established by the Annual General Meeting. In addition, the Working Committee is tasked with meeting the external and lay auditors of the Society and its subsidiaries to inform itself of the focus and scope of the audit and the view taken of the Society and Group’s risks. The results of the Working Committee’s work are to be reported at Board meeting on an ongoing basis. The President is responsible for the on-going administration of the Society in accordance with the Board’s guidelines and instructions. Since the Society’s owners are democratically governed organisations and the Society’s operations are socially beneficial in nature, the President’s responsibility for on-going administration shall be limited to on-going administrative matters that are not significant in terms of principles or otherwise of special significance for the Society. If, in a particular matter, it is unclear whether the right of determination lies with the Board of Directors or the President, the President shall allow the Board to consider the matter or, if it is not possible to await the position of the Board, he shall consult the Chairman of the Board. According to the Economic Associations Act (Chapter 6, Section 6), the President is entitled, in certain instances, to undertake measures without the authorisation of the Board. For the reasons stated above, the President shall, in such instances observe very considerable restriction and always seek consultation with the Chairman of the Board. In accordance with the regulations for financial companies under the supervision of Finansinspektionen (the Swedish Financial Supervisory Authority), the members of the Board of the Kommuninvest Cooperative Society and the President are assessed by Finansinspektionen. Effective from the Annual General Meeting of 10 April 2014, the Board of Directors of the Kommuninvest Cooperative Society has consisted of Ann-Charlotte Stenkil (Chairman), Alf Egnerfors, (Vice Chairman), Carina Blank, Åsa Herbst, Margreth Johnsson, Elver Jonsson, Ewa-May Karlsson, Niklas Karlsson, Örjan Mossberg, Robert Mörk, Magnus Oscarsson, Jonas Ransgård, Roland Åkesson, Bert Öhlund and Lotta Öhlund. The members are presented on page 35. The Board of Directors of the Society appoints an Analysis and Finance Committee. The committee is responsible for monitoring the financial status of the member municipalities and the development of the local government sector as a whole. It also has the task of preparing new member applications at the behest of the Board of Directors of the Society. In contrast to other committees in the Society, it is made up of officials. The reason for this is that the tasks call for extensive specialised economic expertise. The committee’s brief states further that it shall represent different parts of the country, it shall have experience of different types of municipalities and it shall have knowledge of operations in the form of a public enterprise. The Chairman received a fixed fee of SEK 100,000 and a variable fee of SEK 3,500 per meeting. The Vice Chairman received a fixed fee of SEK 50,000 and a variable fee of SEK 3,500 per meeting. Alongside the Chairman and Vice Chairman, two other members of the Board form the Society’s Working Committee and consequently receive an annual fixed fee of SEK 12,000 and a variable fee of SEK 3,500 per meeting. Other Board members received a fixed fee of SEK 6,000 and a variable fee of SEK 3,500 per meeting. Deputy members received a fixed fee of SEK 3,500 per meeting. All members receive a fixed fee of SEK 1,750 per meeting held by telephone. Within the framework for fees to the Board of Directors set by the Annual General Meeting, fees of SEK 179,000 (205,000) were paid to the Chairman of the Board of Directors of the Society, Ann-Charlotte Stenkil, in 2014. The fee paid to the Vice Chairman of the Board of Directors, Alf Egnerfors, totalled SEK 127,000 (134,000). Fees to the other members of the Board of Directors, including deputies, have been paid in accordance with the resolution by the Annual General Meeting and totalled SEK 646,000 (689,000) for 2014. The total fees paid to the members of the Board of Directors of the Society elected by the Annual General Meeting are determined by the Annual General Meeting and amounted to SEK 952,000 (1,027,000) for 2014.